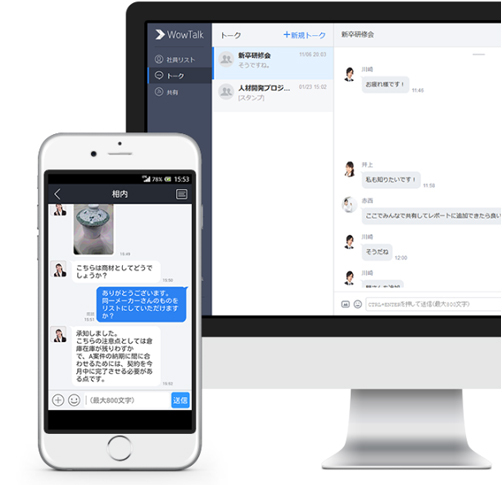 WowTalk is a business communication tool released by KINGSOFT Corporation. This tool enables users to send text messages, photos, and document files anywhere, at any time. There are additional useful features within this tool. The “Timeline” feature allows users to share important information within your company. “Free call” enables you to call your colleagues, for free. WowTalk has simple UI that allows anyone to use it intuitively. Therefore, the system administrator can reduce the cost to make manuals, educate users, and so on. WowTalk differs from consumer chat systems. The System Administrator is able to assign all employees an account and manage them. When an employee moves his department, resigns their position, or loses their mobile phone, the System Administrator can halt or delete their account. The device authentication function allows control over the accessibility of users. When employees lose their mobile phone, the System Administrator is able to stop any access from specified mobile phones and prevent information to be leaked. 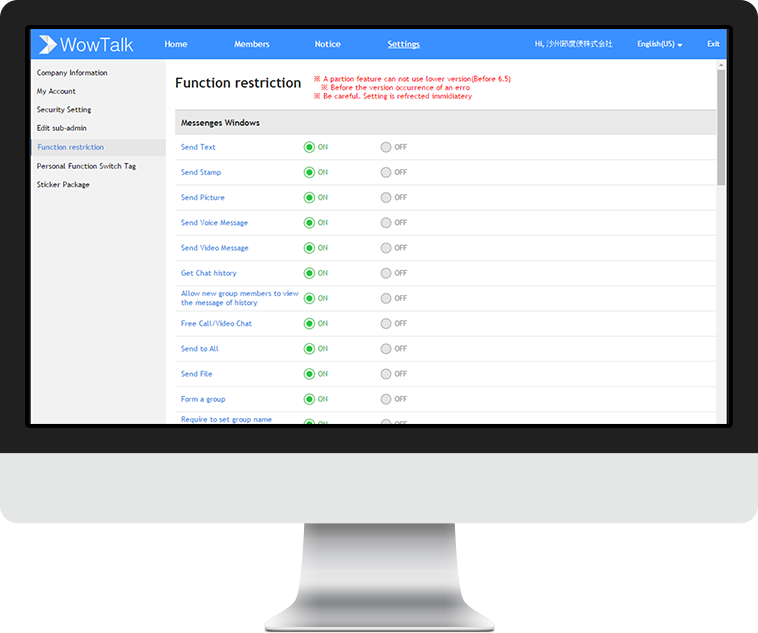 WowTalk allows administrators to keep communication logs and operation history of users. The System Administrator can view these logs and export them using the administrator website. The System administrator is able to import all user account data into a CSV file without retrieving email addresses and other private information. 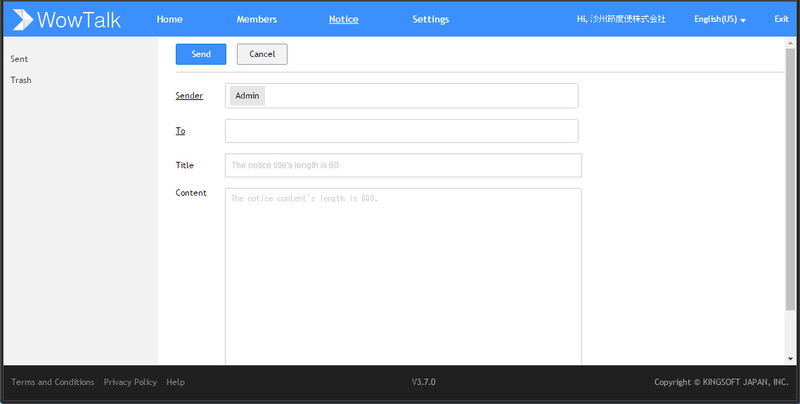 Administrators can delete members, add departments and groups with ease. The System Administrator can send broadcast messages by sending alerts and messages to their favor through the administrator website. This function can be used in emergencies such as natural disasters. The System Administrator can set Functional Restriction toward employees. Control the accessibility of up to 25 functions, including chats, calls, and timeline posts. This function can also set roles and apply it to individual employees. To protect employee privacy and enhance company security, the System administrator can set partitions. This function sets a limit to the readability range for individual employees. When in an environment with internet access, WowTalk can provide IP phoning. 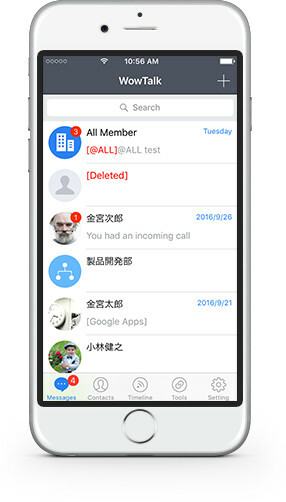 Users are able to make free calls, and also call or video call other members in other branches within the company. By using video calls, employees can hold teleconferences from remote locations. WowTalk’s free call has clear sound. 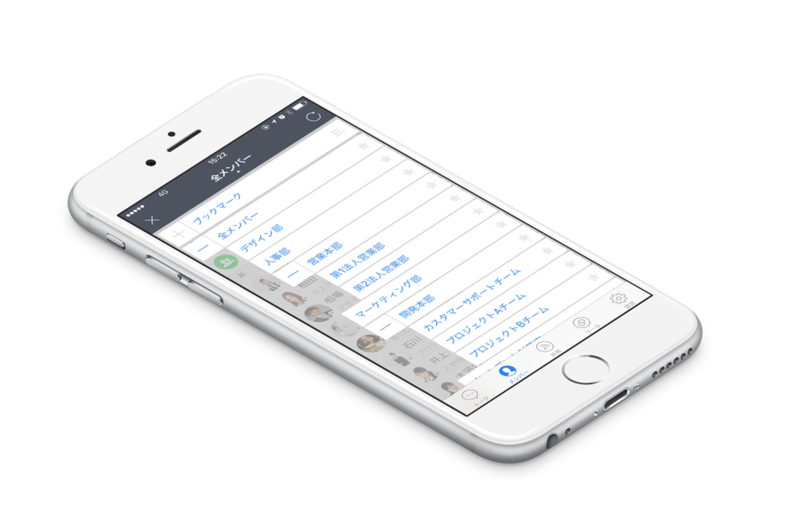 Therefore, this application can be used in place of an actual phone call when employees travel overseas for business trips to reduce communication cost. Conference calls can be held with up to 200 people at the same time through WowTalk. Talk with colleagues face-to-face for smooth communication using Video Chat. 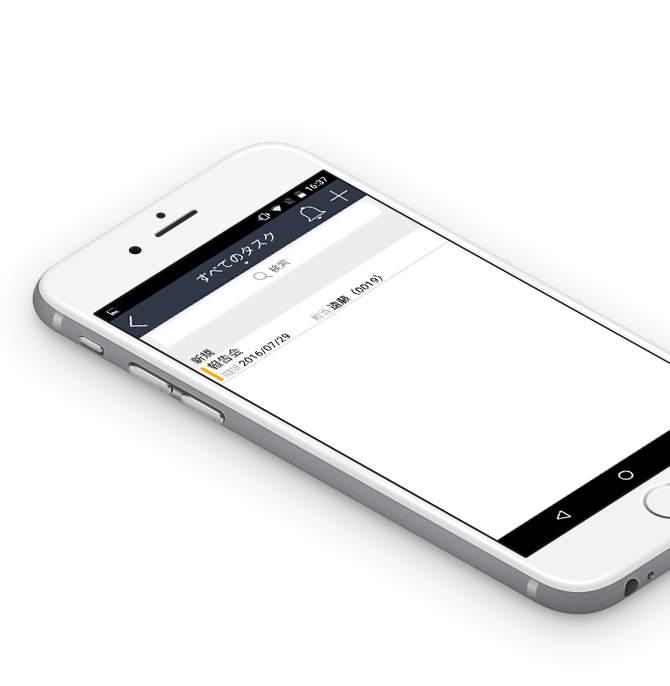 Send messages with simple usability to quickly communicate with other employees. Send messages to specified individuals within a group by inputting an “@” mark at the beginning of a message. You can apply notification settings within individual group by turning notification on/off. Check who has or has not read specific messages by checking the “read”or “sent” mark next to the messages. 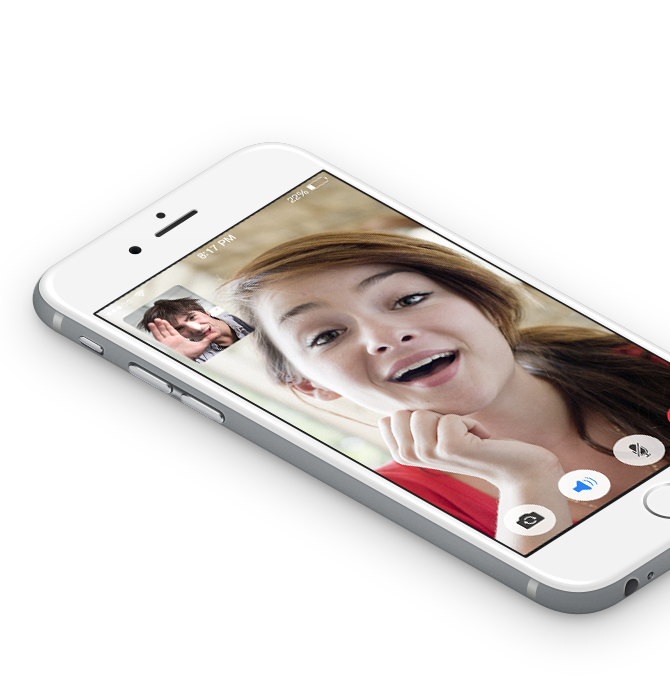 Send videos, voice messages, and up to 9 photos at once within talk rooms. Send files, such as Word/Excel/PowerPoint, that are up to 25mb. Employees can send and receive files through Android and iOS devices, as well as through a web browser. Search through Talk histories by group name, keywords, or dates. Use stamps according to scenes, such as casual, formal, or business. By applying for the Premium Plan, users are able to add original stamps that can be used within the company. Employees are able to submit scripts for the Timeline window, which is a private BBS within WowTalk that enables users to share important information. The Timeline makes certain that the posted information is known to all employees. Employees can use the “like” button and add comments to posts within the Timeline. This function helps to motivate and vitalize communication. Employees can bookmark posts submitted to the Timeline. This function saves and prevents employees from missing important posts. Search posts within the Timeline to quickly find the specific information in need. Employees registered by the System Administrator will be displayed in the member list. Register all employees at once with effortless operation. Administrators can also set the hierarchical configuration of each user, such as positions, departments, and project teams. Employees registered to the member list can be organized by departments and grouped by projects and teams. Once registered to the member list, employees will be automatically be a part of the hierarchical system of the organization. Search a specific employee from the member list by typing keywords, department names, or team names within the search box. Check a colleague’s login status from the Member information window, where their last login time is displayed. This feature is useful for timely communication. Find numerous convenient functions within the tools window. Manage the progress of tasks with the Task Management function. Connect to popular external services provided by Google, such as Google Calendar and Google Drive. By using the Task Management feature, users can begin scheduling, assigning, and creating tasks within a matter of minutes. Users can also manage to-do and team task lists to check if nothing is being missed, find tasks even easier with WowTalk’s powerful search feature, and add photos or leave comments to tasks. By simply setting the Task Management function, users will be automatically notified when someone completes a task or makes a change. WowTalk expands cooperation with Google Apps. When users upload files to Google Drive, they can let other team members know right away by using WowTalk’s group chat. 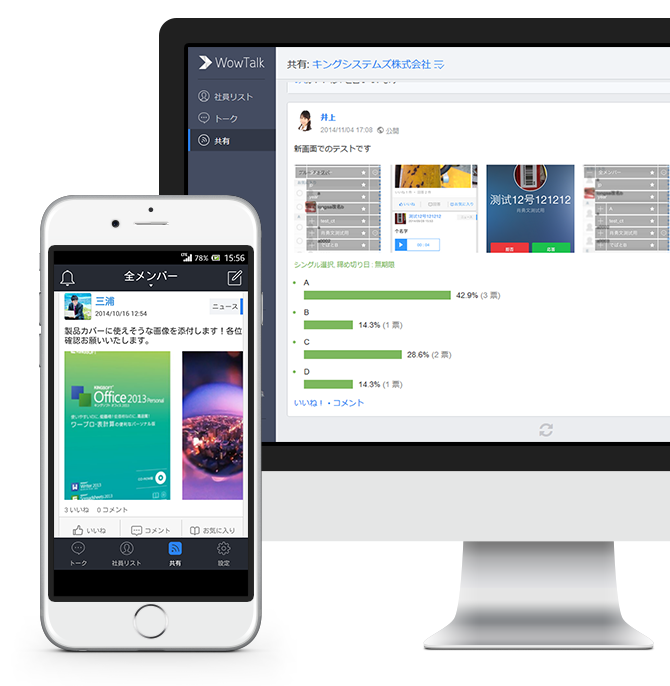 In the same way, you can find a faster and easier way to share schedules with other members.